Today is the anniversary-eve of the Battle of Trafalgar, which was Nelson's finest (and last) hour. In the early years of the nineteenth century there were very real fears of a French invasion, and anything connected with that country was viewed with deep suspicion. 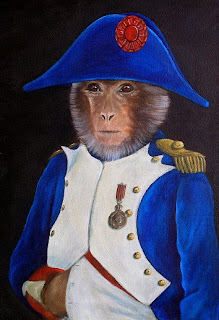 At around this time, legend has it that a French vessel sunk just off the coast at Hartlepool, in the north-east of England, and the ship's pet monkey was washed ashore. The good people of Hartlepool, believing it to be a French spy, arrested the creature, tried it, and sentenced it to death by hanging. When visiting the town today, it is wise not to mention this story, even more than two hundred years after the supposed event, for fear of defenestration. However, I'd like to think that the monkey did in fact escape, and later became the town's member of parliament. I believe his name was Peter.